Last entrance at 5.30 p.m.
and are therefore museum pieces. Please don't touch any piece of furniture nor any object. 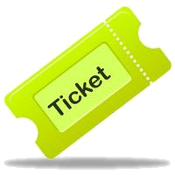 Admission Tickets can be purchased online. Of course tickets can also be purchased at the entrance gate. Hotel, Palace or Farm ? 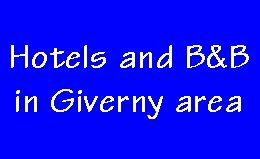 Select Giverny area for your next Stay in Paris ! 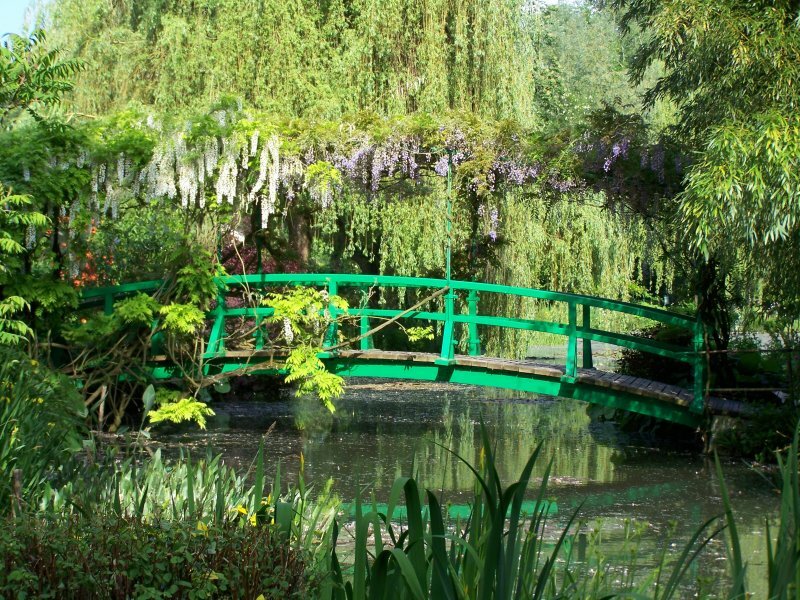 Claude Monet lived in his home at Giverny for forty-three years,from 1883 to 1926. During this very long time, he layed out the house to his own tastes, adapting it to the needs of his family and professional life. At the beginning, the house called House of the Cider-Press (an apple-press located on the little square nearby gave its name to the quarter) was much smaller. Monet enlarged it on both sides. The house is now 40 meter long per 5 meter deep only. The barn next to the house became his first studio, thanks to the addition of a wooden floor and of stairs leading to the main house. 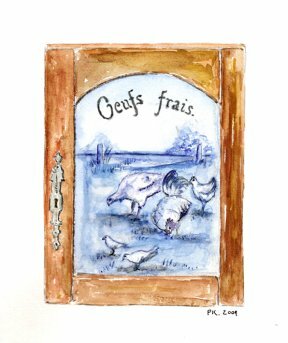 Monet, who mostly painted in the open air, needed a place where to store and finish his canvases. 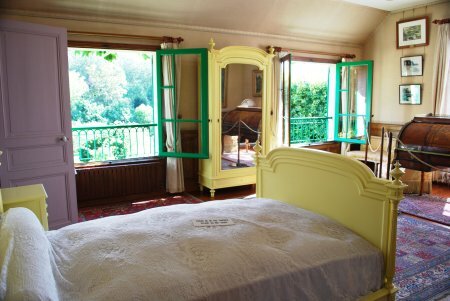 Above the studio, Monet had his own apartment, a large bedroom and a bathroom. The left side of the house was his side, where he could work and sleep. The two wings added by Monet can be noticed thanks to the size of the windows: the new ones are broader than the windows of the central part of the building. 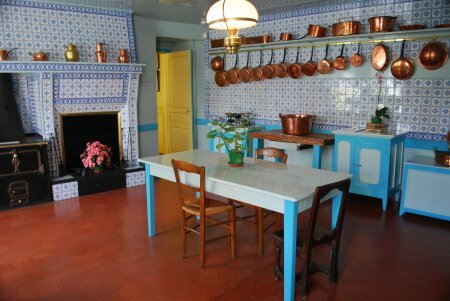 At the other end of the house, Monet designed a large kitchen, suitable to prepare the meals of a ten people family that entertained a lot. Over the kitchen, Monet's four step-daughters had their bedrooms, while his two sons and his two step-sons slept in the attic. 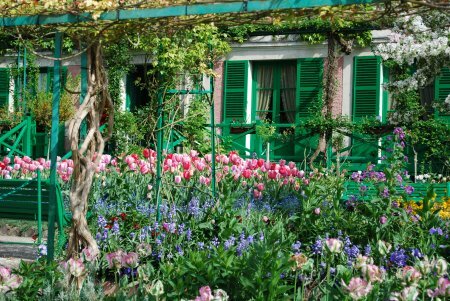 The pink color of the walls and the green of the shutters was chosen by Monet. In those times, shutters were tradionally painted grey. 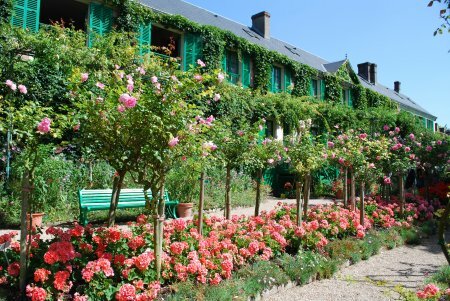 Monet added a gallery in front of the house, a pergola covered with climbing roses, and grew a virginia creeper on the facade: he wanted the house to blend with the garden. The house has three entrances. The left one leads to Monet's apartment, the middle one is the main entrance, the right one is for domestic use and leads to the kitchen. 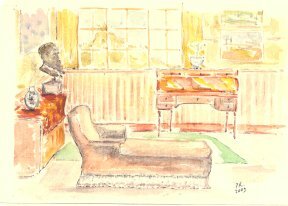 The tour of the house starts with the little sitting-room where Alice Hoschedé-Monet sat with the children. Monet, who loved colors, chose all the colors in the house. 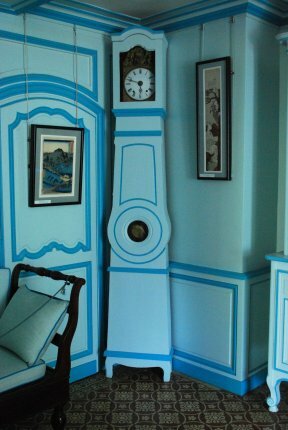 The stunning blues of the sitting-room, on the walls and on the furniture, harmonise with the japanese woodblocks that Monet collected passionately for fifty years. The painter owned 231 of them. He liked seeing them around, they inspired him very much. 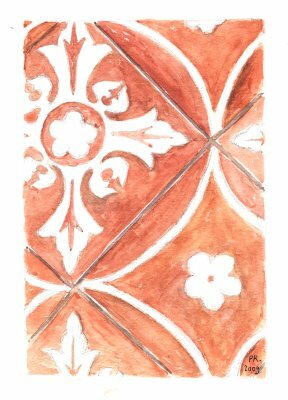 On the floor, cement tiles were very trendy at Monet's times. 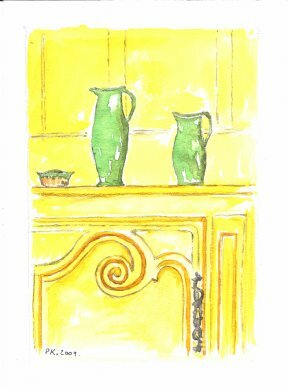 The next room is Monet's entrance, fitted out into a small pantry. It was not heated, thus enabled to store food, especially eggs and tea. Lots of eggs were eaten. They were layed by the hens of the chicken yard. The two boxes hanging on the walls could store 116 eggs! The furniture in bamboo style are typical for the Japonism fashion of the times. The buffet has got keys, even on the drawers. Food was expensive and locked down. On the walls, reproductions of Monet's works evocate the atmosphere of the place at Monet's times. The painter liked to keep a record of each step of his career. 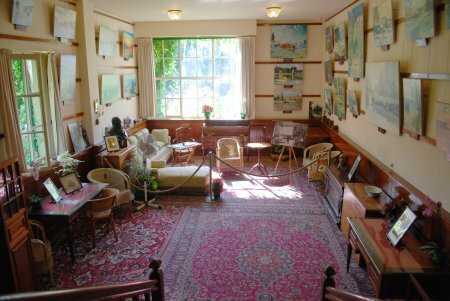 Many of the originals that were kept in this room are now to be seen at Musée Marmottan-Monet in Paris. 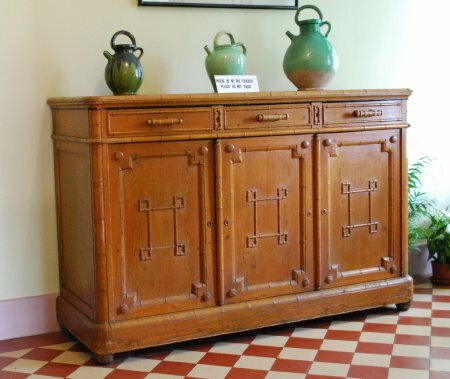 Like everywhere in the house, the furniture and the objects are still exactly the same, what gives a great authenticity to Monet's home. A bust of Claude Monet by Paul Paulin reminds that the leader of impressionism became famous during his lifetime, although he had to wait until he was fifty before he was eventually recognized as a master. A very steep staircase leads from the pantry to the upper floor. One first enters Claude Monet's bedroom. 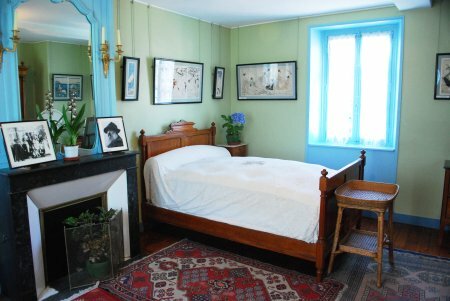 Monet slept in this very simple bed, and died there the 5th December 1926. The painter had gorgeous views on the garden out of the three windows. The delicately adornated desk and the commode date back to the 18th Century. 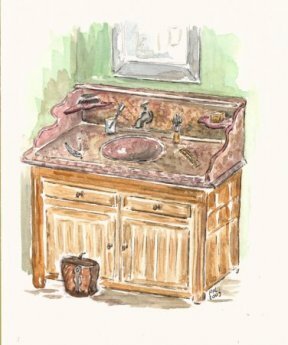 Claude and his wife Alice didn't share the same bedroom, as was usual in the middle upper class, but there was a connection through the bathrooms. The very simple bedroom of Alice is decorated with japanese woodblocks featuring female characters. It is one of the few rooms that have a window on the street side, that is to say to the north. One can see how narrow the house is. 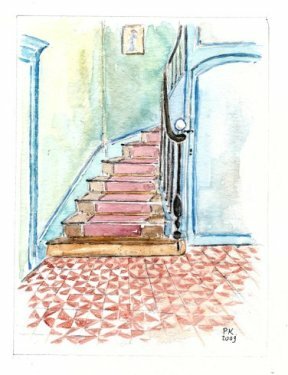 From her bedroom, Alice could keep an eye on the children on the other side of the landing. At the top of the main staircase, a closet was used to store the linen. The main staircase leads to the dining room, the most dramatic room of the house. Monet, who didn't care for fashion, which was very dark and heavy in Victorian times, had it painted in two tones of yellow. This vibrant color enhances the blues of the dishes on display in the buffets. The walls are packed with japanese engravings that Monet chose with an expert eye. For fifty years, he collected the prints by the best japanese artists, especially Hokusai, Hiroshige and Utamaro. The dining room is connected to the kitchen to make service easier. 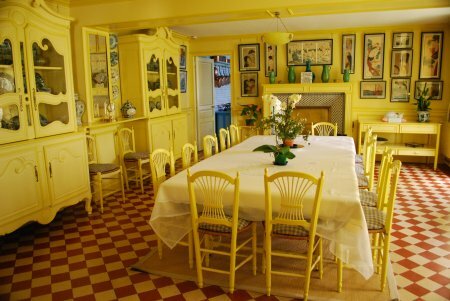 Monet wanted a blue kitchen so that the guests would see the right color in harmony with the yellow dining room when the door to the kitchen was open. 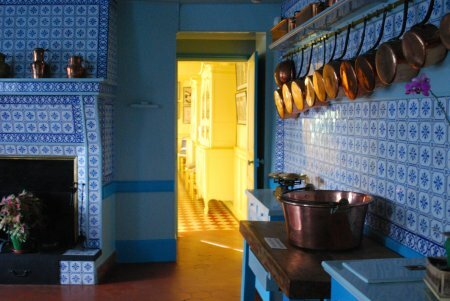 The walls of the kitchen are covered with tiles of Rouen. The coolness of the blue contrasts with the warm glow of the extended collection of coppers. 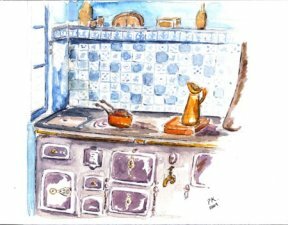 An enormous coal and wood stove kept the kitchen very warm year round. The exit is by the kitchen stairs on to the garden.